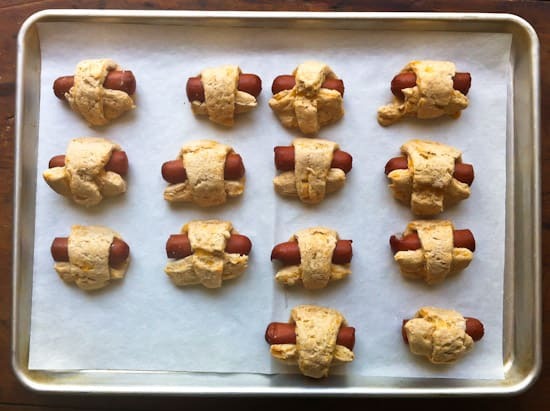 I haven’t been cooking much lately because we’ve been so busy, but every once in a while I get an urge to make something strange like these whole wheat pigs in a blanket. They made a fun and fairly quick lunch and were surprisingly delicious. I wasn’t planning on writing about them, but they turned out to be really tasty, so why not share? It’s been an interesting week so far, beginning with a trip to the cabin on Sunday. Every year at the end of October, which is hopefully before any big freezes hit, the water gets shut off for all the cabins and everything pretty much shuts down for the winter. A bunch of family usually gets together up there for the last weekend to do any end-of-season maintenance that needs doing, including draining water and adding antifreeze to the pipes, cleaning pine needles off the roof, and storing outside furniture under the cabin. We also clean out the kitchen and divvy up condiments and pantry items that won’t survive the winter. Our cabins are located in what was once a thriving logging camp in the Sierra Nevada. When that particular logging operation shut down or moved (I’ve heard the history of this place so many times I can’t believe that I still don’t know the details), the cabins were eventually sold off to private owners. My great-grandparents bought one first and eventually my grandparents were able to buy the cabin next door. My great-grandparents passed years ago and my grandparents, while still very active, haven’t made it up there for a few years now. But both cabins are thankfully still in the family and I feel really lucky that we can drive an hour and a half from here and be in a world free of telephones, television, and internet. My Dad spent much of his childhood up there because my grandmother and the kids would just move up to the cabin during the summer to avoid the valley heat. Back then there were services in camp that made it easier to live up there for a few months, including a store. I’ve been going to the cabin since before I was born, and though we never spent entire summers up there, it has always felt like a home away from home. The best thing about moving back to the valley, other than being near my family, is that I am close to Central Camp again. So that’s what yesterday’s photos were about – closing the cabins for the winter. I’m already looking forward to next spring when a bunch of us will head back up to open them again. The rest of this week has been about blog posting, voting, and checking on the progress being made at the new house. Voting was fun this year. After years of voting by mail as an Oregon resident (we kept our Oregon residency the entire time I was moving around as a military spouse), I am officially a California voter and therefore cast my ballot for the first time in person. It was a lot of fun to walk the few blocks to our neighborhood polling place and participate in this important thing with my neighbors. I especially enjoyed seeing the mix of people who were volunteering and showing up to vote. For the first time, this neighborhood that I have hardly been able to stand for the last couple of years felt like a community. As for the progress on the new house, everything is finally speeding up. The house we bought is in my hometown of Madera, California, which is about 30 minutes from Fresno. Honestly, I never thought I’d literally be moving home, but the universe seems to have decided that I belong in Madera for right now. I’ll be living just a few blocks from my grandparents and a few blocks from my aunt Kathy. It’s also a few blocks from where my other grandmother lived before she passed away. Two of my great grandmothers also had houses within walking distance when I was a kid. I didn’t live in that neighborhood when I was young, but I practically grew up there because so much of my family did live there. I rode my bike, roller skated, and walked up and down the streets. I wandered these same blocks selling Camp Fire candy and trick-or-treating every year. I spent every holiday at one or both of my grandparent’s houses and still do. In the years after my mom died and before I moved back to the valley, this was the neighborhood where I’d stay when I would come home to visit family. It’s more familiar to me than any neighborhood in the world and I’ll be living there by the end of next month. It will be weird, but I think it might be good for me for a while. So, the house we bought was built in 1947. It’s brick, it’s on a big corner lot, and I think it has the potential to be a really cool house. My favorite part? The beautiful meyer lemon tree in the courtyard. Oh, and the fact that it has a courtyard. We’ll also have pineapple guavas, strawberry guavas, tangerines, figs, and loquats. Plus, whatever we decide to plant. There’s plenty of room for more trees and a big garden. And we’re hoping to eventually keep some chickens, since that’s allowed in Madera. I inherited part of the house, which is why I ended up buying it in the first place. The problem is that it was a complete and total disaster when it came into our possession. I will get into the whole story later, but the months leading up to the purchase of this house were pretty terrible and despite all the wonderful things I said about it in the paragraph above, I have had many sleepless nights wondering if I made the right decision. In order to make it liveable, we had to replace the roof, rip out all flooring, and gut the kitchen entirely. The plaster walls and ceilings all needed repair and repainting. There is plumbing and electrical work to do, the windows need to replaced, and it needs to be tented for termites. Did I mention that it was overrun with rodents and cockroaches? Yeah. Well, with lots of help of family, painters, electricians, and a plumber, we’ve made some progress, and I do think it’s going to be a great house. The most important thing is that the roof was replaced before the first rain. The kitchen is still gutted and a couple walls are open in there, but the cabinets are being built and appliances have been ordered. Today I think the gas line is being run to the kitchen for the range and then my Dad will be there this weekend to put kitchen walls back together so the painters can get in there before the cabinets are delivered. Once the cabinets are in, we can install flooring and counter tops. Once the flooring is installed, the appliances can be delivered. The painters have done a great job fixing the walls and as of yesterday, the ceilings, bedrooms, and bedrooms were painted. If all goes well, we should be in there before Christmas. I don’t think I’m going to share any photos of what it looked like before we started making improvements because I don’t really want to be reminded of it. But I think I will post some photos as we get closer to the end. None of this really has anything to do with Pigs in a Blanket, but that’s what I happened to make for lunch yesterday before I went to Madera to check in on the house. Phil went to the store the other day to pick up some snacks for a football game he wanted to watch and he came home with TWO packages of Hebrew National hot dogs. He said he thought the packages looked too small (there are only two of us in this apartment). This is why Phil isn’t in charge of grocery shopping. So, I obviously had some hot dogs in the fridge that needed to be used up. I’ve never made pigs in a blanket before, but I think most people make them with canned crescent dough or biscuit dough or something. I’m really not sure. I just figured some homemade biscuit dough wrapped around the dogs would bake up into something edible, so I went with that idea. I had some soft white wheat berries in the pantry so I decided to grind them for fresh whole wheat pastry flour. I know not everyone has a grain mill sitting on their counter, so obviously you can use store-bought whole wheat pastry flour or regular whole wheat flour, or just all-purpose flour. A combination of whole wheat flour and all-purpose flour would be a good substitute for whole wheat pastry flour. Any of those should work fine, but you might have to adjust the liquid a bit one way or the other. I also had some good leaf lard on hand that I rendered a few month back, so I used that. It makes great biscuits and pie crusts. You can use lard, unsalted butter, or shortening, depending on what you have. Since I wasn’t using those miniature hot dogs, I just cut regular sized hot dogs in half. These were a bit bigger than appetizer size and three of them made a perfect lunch for me (I think Phil had at least six). They are great with lots and lots of mustard! In a large bowl, whisk together the flour, sugar, baking powder, baking soda, and salt. Rub the lard or butter into the flour with your fingertips or cut with a pastry blender until the mixture resembles coarse crumbs. Stir in the grated cheddar cheese. Add the buttermilk to the flour mixture and stir with a wooden spoon until well combined. If the mixture is very sticky, add a bit more flour. If it seem too dry, add a little extra buttermilk. Turn dough out onto a floured counter and pat or roll it out into a 15 by 7-inch rectangle, trimming edges if necessary to make a well-formed rectangle. Using a pizza cutter or a knife, cut the rectangle into thirds horizontally then slice each into thirds vertically so that you have 9 small rectangles. Slice each rectangle diagonally into two triangles. You should end up with 18 triangles. One at a time, roll the little hot dogs up in the triangles and place on the lined baking sheet with the point down. If the triangles are sticking to the counter, lift them up with a thin metal spatula and dust underneath with a little flour before rolling. If the dough breaks while rolling, just pat it back together. They might not look perfect, but they’ll hold together after baking. Bake at 400 degrees for 12 to 13 minutes, until golden brown. Enjoy with lots of mustard. Those look delicious! I love pigs in a blanket. Welcome back to the neighborhood ! I loved this. My stepfather was from Fresno, and although you're 30 minutes away, I can only think of the summer heat you must endure. But I'm excited about your house. The work will pay off and it will be wonderful. Hang in there, and good job on NaNoBloPo! Great post! What an exciting and challenging time, but you're going to be so happy in your house. 18 years ago, we moved into a wreck of an antique cape (200 years old). It's been a steady project (less so in the last few years than before), but I love having made this old place OUR place. I can't wait to see pictures of what you've done! I want like, 756 trillion of these. I made these for dinner tonight, and they were delicious!